BOGOTA, Mar 15 2013 (IPS) - Late Venezuelan leader Hugo Chávez played a key role in the current attempt to negotiate peace in Colombia. Along with Cuban President Raúl Castro, he confidentially urged the FARC guerrillas to agree to Colombian President Juan Manuel Santos’s secret proposal for peace talks. For years, the late Venezuelan president and Cuba’s Fidel Castro had argued that armed struggle was a thing of the past. And Raúl, Fidel’s successor, took the same stance. Chávez,who governed Venezuela since 1999 and died on Mar. 5, also provided the logistics to transport the FARC’s negotiators abroad incognito during the preliminary talks, when Santos decided that the contacts should no longer take place in Colombia. Getting the two sides together “was the hardest past,” according to political scientist Ronal Rodríguez, a professor and researcher at the Venezuela Observatory of the private University of Rosario, in Bogota. Once that was achieved, Norway and Cuba assumed the role of guarantors and Venezuela apparently took a backseat, as a facilitator, along with Chile. “In politics, only what has already happened is certain,” former Colombian minister Horacio Serpa told IPS. But the most likely scenario is that acting president Nicolás Maduro will be elected president of Venezuela in the Apr. 14 elections. “In that case, as he has specifically stated, he will continue along the lines followed by President Chávez in this matter,” Serpa said. “The challenges that lie ahead mainly concern the negotiating parties, so Venezuela’s role will not be as important as it has been up to now,” he said. But he said that if Maduro is elected, it would “give continuity to the process” and would give the FARC confidence regarding Venezuela’s presence as one of the guarantors that the peace talks would continue to move ahead. Like the FARC, a smaller rebel group, the National Liberation Army (ELN), has also been active in Colombia since 1964. And far-right paramilitary groups, which were partially dismantled in 2006 after closed-door negotiations with the Colombian government, are another actor in the conflict. “As in the case of all borders during wars, cross-border routes are sought for smuggling arms, provisions of all kinds and financing by means of legal and illegal operations,” former minister Camilo González, director of the Institute of Studies for Development and Peace, told IPS. According to accounts gathered by IPS along the border in November, remnant or regrouped paramilitary bands are also active in the Venezuelan border cities of Ureña, San Antonio and San Cristóbal, the capital of the state of Táchira, where they extort local traders and businesses. “I think there will be continuity,” said Carlos Velandia, known as “Felipe Torres” when he was a member of the ELN national leadership. Now he is dedicated to research and consulting on peace. His arguments are based on Maduro’s close involvement “in the construction of Venezuela’s willingness to support a political solution to the conflict” and the fact that “the conflict has leaked across the border, and also affects Venezuelan territory. “And the only way to put an end to it is to negotiate peace here in Colombia,” he added. 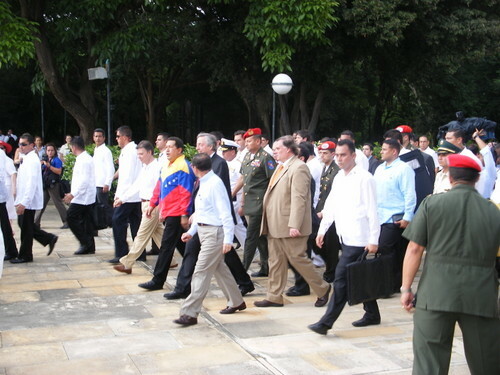 “The presence of foreign forces is disturbing Venezuela’s democratic stability,” Velandia said. That means that “Venezuela has no alternative other than supporting a political solution in Colombia, because its security and tranquillity depends on that,” the former guerrilla said. But above all, “he was able to show the FARC that the conditions were in place to lay down their weapons, without renouncing their political objectives. Chávez established himself in power without weapons, simply with votes, and with them he subordinated the Venezuelan armed forces,” he told IPS. “When they agreed to peace talks, the FARC had the Chavismo model in mind. They decided to trade bullets for votes because it is possible – as shown by Venezuela (where Chávez, as an army lieutenant colonel, led a failed coup attempt in 1992). But if that door is closed, the peace talks in Havana will fall apart,” Molano said. Christian Völkel, a Colombia analyst with the International Crisis Group, takes a less pessimistic view. “Regardless of how important Venezuela’s participation was in the secret phase of talks, the negotiations now have enough momentum of their own to sustain them,” he told IPS. “Chávez, without a doubt, was the politician that the FARC respected the most,” but that doesn’t mean his death “will have a dramatic effect,” he argued. “The two sides have been negotiating in Havana for five months, and it looks like they’re already moving towards agreements,” said Völkel, referring to progress that has apparently been made on the issue of land ownership, the first question on the six-point agenda for the talks.